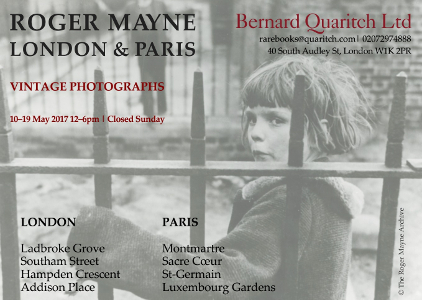 Roger Mayne – London & Paris brings together recently discovered vintage prints from the archive of the acclaimed post-war British photographer Roger Mayne. The exhibition displays photographs that capture the vibrancy of 1950s and 1960s London. As well as prints from Roger Mayne’s acclaimed Southam Street series, the exhibition highlights those from the wider Notting Hill and North Kensington areas. The Paris series features scenes which even those familiar with Mayne’s work will not have seen and exhibit the strongest characteristics of his oeuvre in a new setting. The exhibition opens today and runs until 19 May, 12-6pm, closed Sunday. We look forward to seeing you.